In a continued attempt to better explain the 2017 federal income tax brackets, here is a graphical breakdown of a simple scenario for a married filing joint couple with 1 dependent. See also my previous examples for a single filer with no dependents and married filing joint with no dependents. I will try to explain the differences in terms such as gross income, taxable income, marginal tax rate, and effective tax rate. Simple example. Let’s say your combined gross income is $100,000 a year. You are a married couple with one child under 16, and both earn $50,000 gross income. You are both employees that receive W-2 income only (i.e. neither are self-employed). You don’t have any additional income sources like interest, capital gains, rents, etc. You don’t have any extra deductions like IRA/401k contributions or mortgage interest. You live in a state with no state income tax. Gross income. Let’s start with your annual $100,000 gross income. You each get a personal exemption of $4,050 in 2017, including your dependent child. That’s $4,050 x 3 = $12,150. You also get something called the standard deduction which is $12,700 for married filing joint in 2017. Since you don’t have a lot of itemized deductions, you fall back onto the standard deduction. The first 24,850 of your gross income is not taxable. Without doing anything special at all, your $100,000 in gross income is now only $75,150 in taxable income after personal exemptions and the standard deductions. If you’ve already done your taxes, your taxable income should be line 43 on Form 1040, line 27 on Form 1040A, and line 6 on Form 1040EZ. The first $18,650 of taxable income is subject to a 10% tax rate. Shave off 10% of $18,650 and put that on your tax bill ($1,865). The remaining $56,500 of taxable income is moved onto the next tax bracket. The next $57,250 in taxable income is subject to a 15% tax rate. However, we only have $56,500 left. So we shave off 15% of $56,500 ($8,475) and add that to the existing $1,865. The total tax bill is now $10,340. In this example, this 15% is your marginal tax bracket. If you earned another $1, it would be taxed at this marginal rate of 15%. Even with a six-figure income, a couple with at least one kid can still land in the 15% marginal tax bracket (pre-tax 401k or IRA contributions would reduce taxable income even more). Federal Child Tax Credit. As this income doesn’t exceed the phaseout limits and your child is 16 or under, you also get the full $1,000 Child Tax Credit. A tax credit lowers your tax bill dollar-for-dollar as opposed to a deduction that only lowers your taxable income. Thus, your tax bill is reduced from $10,340 to $9,340. Overall effective tax rate. You paid $9,340 in federal income taxes on $100,000 of gross income, for an average or overall effective tax rate of 9.34%. Again, you also paid 7.65% in payroll taxes. 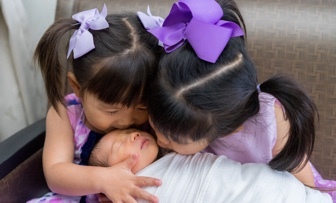 Your average tax rate is lower than a couple without kids due to the combined effects of the additional personal exemption and the child tax credit. In this specific example, having a kid reduced your tax bill by $937.50 + $1,000 = $1937.50. 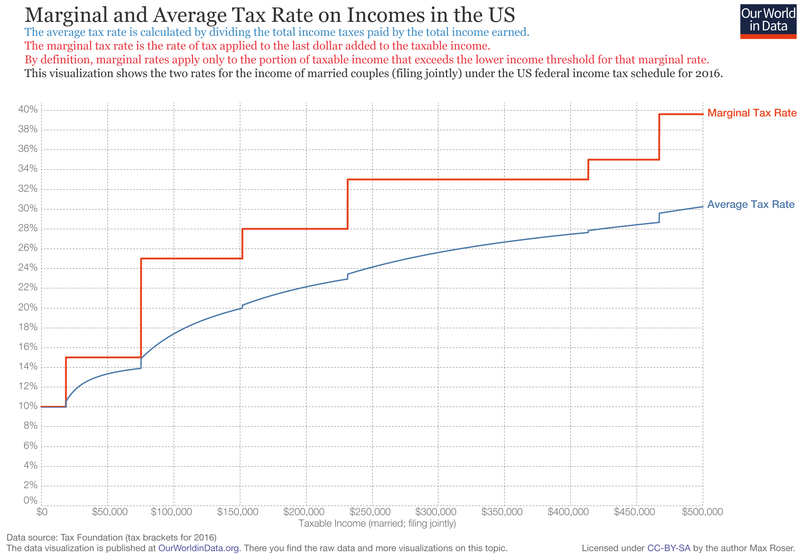 Here’s a chart from OurWorldinData.org that shows how the average tax rate changes with taxable income (2016, married filing joint with no kids).